Returning in early 2017, Disney Cruise Line Guests can celebrate the legendary adventures and iconic characters from the Star Wars saga during Star Wars Day at Sea. New in 2017, the Disney Fantasy special sailings expand to both eastern and western Caribbean itineraries and nearly double in number to 15 cruises. During this day-long celebration, Star Wars Day at Sea combines the power of the Force and the magic of Disney for an out-of-this-galaxy cruise experience unlike any other. Each sailing features a full day of dark side and light side fun, including official appearances of Star Wars characters, a deck party and fireworks, Star Wars-themed family and youth activities, at-sea screenings of Star Wars films, unique food and beverage offerings, and special merchandise. Throughout the day, Star Wars Younglings, Padawans and Jedi Masters alike can enjoy the immersive and intergalactic entertainment, including a deck party and fireworks display, exclusive event merchandise, and specialty Star Wars-themed food and beverage items. Characters from across the Star Wars galaxy will also be onboard for interactions, photos and also may be seen patrolling the decks. And, in “Jedi Training: Trials of the Temple,” Force-sensitive children learn the ways of the Jedi and use their new-found skill in a final face off with Darth Vader. 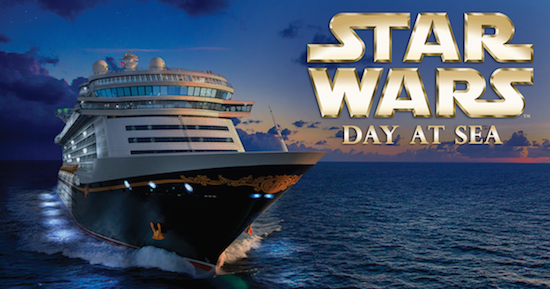 Star Wars Day at Sea will be on Disney Fantasy seven-night cruises sailing from Port Canaveral on Jan. 7, 14, 21, 28; Feb. 4, 11, 18, 25; March 4, 11, 18, 25; April 1, 8 and 15, 2017. Departing Jan. 7, 21; Feb. 4, 18; March 4, 18; April 1 and 15, 2017, the western Caribbean itinerary includes Cozumel, Mexico; Falmouth, Jamaica; Grand Cayman and Disney’s private island in the Bahamas, Castaway Cay. Departing Jan. 14, 28; Feb. 11, 25; March 11, 25; and April 8, 2017, the eastern Caribbean itinerary includes Tortola, St. Thomas and Castaway Cay. Click here to learn more about Disney Cruise Line! This entry was posted on March 11, 2016 at 9:05 am and is filed under Disney Cruise, Disney News, Disney Vacation Planning. You can follow any responses to this entry through the RSS 2.0 feed. You can leave a response or trackback from your own site.